A Hyperloop is a shuttle that travels on magnetic rails, somewhat like a train, but which runs in a tube with little or no air. In theory, Hyperloop capsules could allow travel faster than the speed of sound. US-based Hyperloop Transportation Technologies or HyperloopTT has unveiled its first full-scale transportation capsule at Puerto de Santa Maria, Spain, which will be ready for passengers in 2019. The 32-metre "Quintero One" passenger capsule will be delivered to HyperloopTT's research and development centre in Toulouse, France, for additional assembly and integration into the system before it is used on one of the first commercial tracks, the company said in a statement. "In 2019, this capsule will be fully optimised and ready for passengers," said Bibop Gresta, chairman and co-founder of HyperloopTT. "Since we have taken major steps in solving government regulations with our safety certification guidelines and insurance frameworks, we are now closer than ever to bringing Hyperloop to the world," Mr Gresta added. The 5-tonne capsule has 72 sensors, 75,000 rivets and 7,200 square metres of fibre. It is constructed completely out of HyperloopTT's "Vibranium", a specially made dual-layer smart composite material. "The creation of this capsule represents over a year long journey of the best expertise in design, engineering and the development of cutting edge materials," said Dirk Ahlborn, HyperloopTT co-founder and CEO. 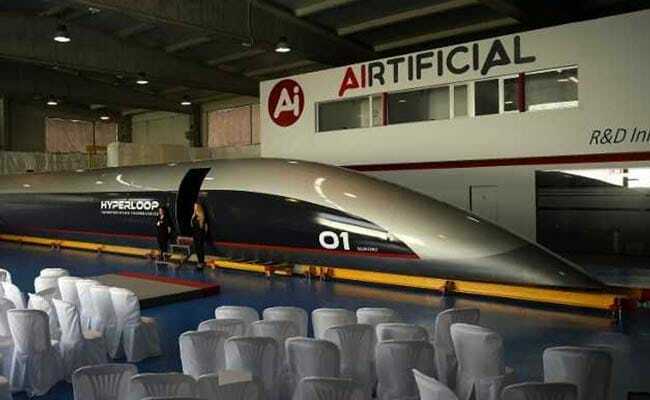 In May, HyperloopTT had proposed to set up the Hyperloop transportation system in Andhra Pradesh, connecting Anantapur, Amaravati, Vijayawada and Visakhapatnam as part of 700-800-km-long integrated public transit system. The Maharashtra government too had signed a pact with the Richard Branson-led Virgin Group to build the Mumbai-Pune Hyperloop.